Fits cubicles walls with thickness of 1.5" - 2.5"
Mix, match and connect multiple boards to create your own unique individual system using these Matrix Cubicle Partition Hangers. These hangers are designed to fit cubicle walls that measure between 1.5" and 2.5" thick and are designed for use with the Quartet line of Matrix Whiteboards and Bulletin Boards. We have a total of about 100 of these through-outs our office and they work great! Nothing ever falls off, and they can be used to squeeze another board on the other side of the cubicle underneath the back side of the hanger and it holds both up just fine. Buy 1 set, hold up 2 dry erase boards. We have all sizes of dry erase boards hanging by these, up to 4' x 5' boards. Welcome to MyBinding.com. 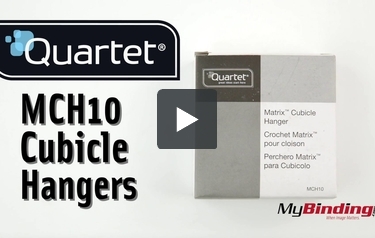 These are the MCH10 Cubicle Partition Hangers 2-Set from Quartet. Create your own unique board system using these sturdy hangers. They’re able to hang boards weighing several pounds over cubicle wall frames between 1.5-2.5” thick. Use the grey plastic pieces to connect boards together so they won’t slide apart. These hangers are compatible with Matrix, InView, Prestige series, and many other whiteboards and bulletin boards. For more videos and all your binding needs, go to MyBinding.com.